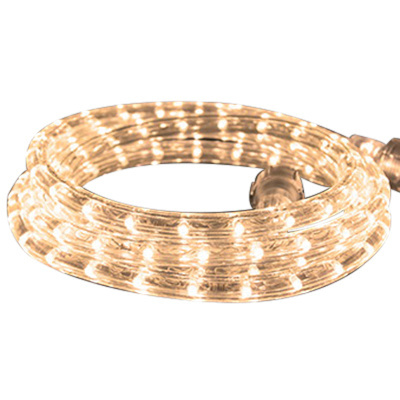 American Lighting Flexbrite LED Rope kit delivers 32 Lumens/ft of warm white light at just 15-Watts. It has a color temperature of 3000K and CRI of 72 for superior color rendering. The lamp lasts up o 60000 hours. It is dimmable with most incandescent, low voltage magnetic and low voltage electronic dimmers for greater energy efficiency. The kit includes removable 5-ft power cord with 1.6-Amp inverter and fused 120-Volts AC, 2-prong plug, removable cap on opposite end and 1 clip per foot of light. It is suitable for accent lighting, decorative lighting, outline, architectural detail, patio, deck and gazebo. LED rope kit is UL listed.